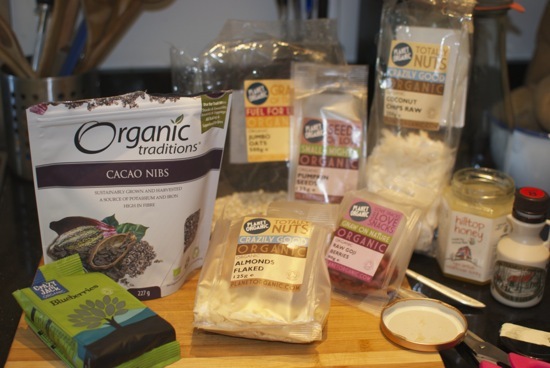 There's been a lot of talk in the last half decade or so about super foods. God-like substances that are supposed to cure person-kind of all of our ills. After some investigation via smoothie making, as far as I can tell, these super foods are just food. All food, even things like beef, and cheese and bread, are super foods when they are raised, or grown or made with care. You can use exotic sounding ingredients like Acai Berries or Cacao nibs, or you can use Sun Kissed Raisins and TollHouse chocolate chips and get the same results. They should all be eaten with the same philosophy of balance that applies to any food. A beautiful artist that I knew in New York named Paloma Young always had a large jar of delicious home-made granola on her counter. The jar was a satisfying heavy apothecary jar with a glass top that made an amazing thunking sound when you closed it. I remember making constant trips over to the jar just for the love of opening and closing it. Her recipe for granola was equally satisfying, heavy clusters of sweetened oats buoyed by a embarrassment of other nibbles that always kept you coming back. 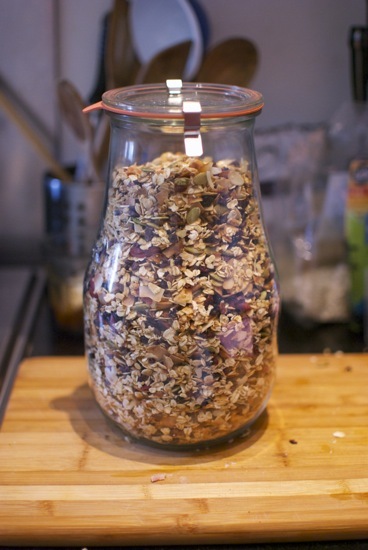 I haven't found quite as satisfying a jar (though I think mine is very acceptable,) but I think this granola recipe is great. I used two sweeteners with the granola, Ontario Maple Syrup and raw honey that I melted down for drizzling purposes. I know Paloma would sometimes add a spoonful of peanut butter when she was melting her sweeteners, which I always thought was a great idea. If you can't find things like Acai (A-Sign-Ee) berries, or Cacao (Ka-Kow) nibs, then I think raisins and regular old dark chocolate are fine. Each food in this granola can claim some interesting health benefits, but if it didn't taste good all together, I wouldn't have included it. When all is said and done, taste is the superlative aspect of any food we eat. Another beautiful lady in New York City named Katherine Nyce showed me how to put together a chia (chee-ya) seed yogurt cup. At night, Katherine layers the yogurt mixed with chia seeds, then granola then fruit, then just grabs the jar on the way to her train. The overnight soak helps break down the chia and our bodies digest their nutrients. I make these ahead and then wolf it down on my way out the door, as I am invariably always running late. 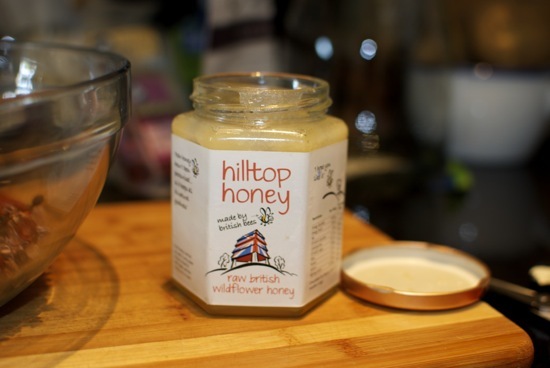 Melt the honey and maple syrup in a small small. Toss oats, coconut and almonds with the honey and syrup and spread across a baking sheet. Toss in an oven at 275F, and flip every five minutes or so until mixture is evenly golden toasted. Allow to cool and then toss with all over ingredients. 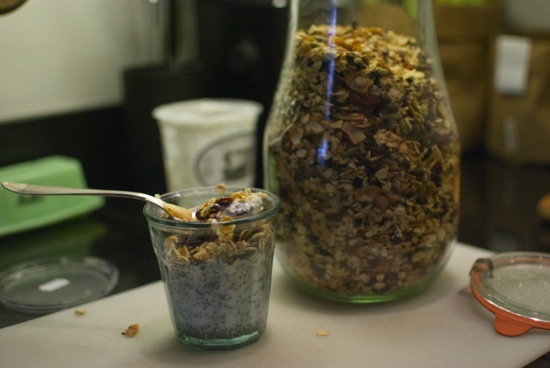 For yogurt cups, mix a table spoon of chia seeds with your favorite yogurt. Place in the bottom of a jar, layer granola on top, then your favorite chopped fruit. Leave in the fridge over night and enjoy for breakfast. Want to know about these ingredients?